2. Place cod fillets in a 9×13 baking dish. Dot fillets with butter, sprinkle with herbs. Set aside. 3. Slice potatoes into 1/4 inch slices. Turn and slice again into 1/4 inch strips. 4. Toss potato strips in 2 tablespoons olive oil. 5. Lay potatoes strips in a baking sheet in a single layer so that none are touching. 6. Place the cod on oven’s upper rack and potatoes on lower rack. 7. After 15 minutes, flip fries. Switch fries and cod to different racks. 8. While baking, mix Parmesan cheese, paprika, onion, garlic and salt. Set aside. 9. Heat non-stick skillet over medium-high heat. Add 1 tablespoon olive oil. 10. Saute Brussels sprouts, toss frequently for 15 minutes. 11. Add wine and balsamic vinegar. Toss frequently, until the liquid is reduced by half. It will be like thin syrup. 12. 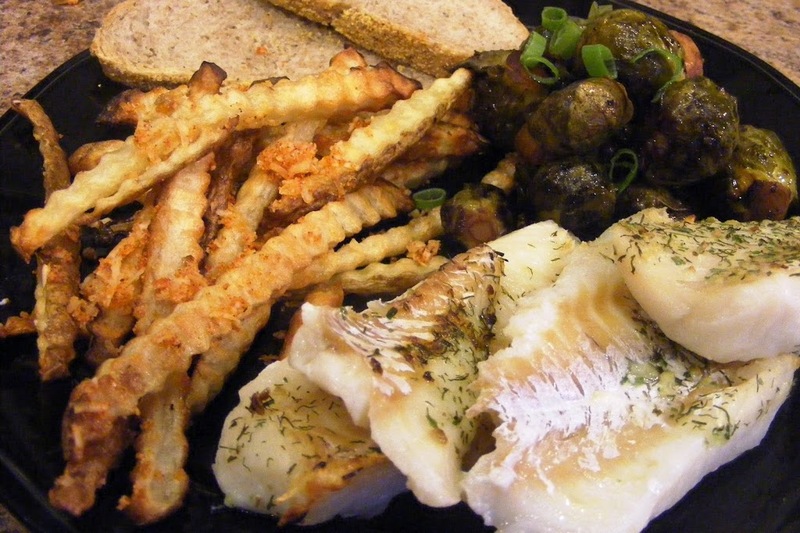 Fries and cod will be done after 30 minutes in the oven. Sprinkle Parmesan seasoning over fries. This meal took about 10 minutes to prepare, and thirty minutes to cook. It is fast and simple.